UNICEF representative in Yemen Meritxell Relaño checks on a boy suffering from malnutrition at Al-Sabeen Hospital, Sana’a, Yemen. The top United Nations relief official has expressed his deep concern about the deteriorating humanitarian situation in Yemen, noting that a record 22.2 million people are now in need of assistance – 3.4 million more than last year. “I remain deeply concerned by the humanitarian situation in Yemen, which has continued to deteriorate because of on-going conflict, collapsing basic services and economic decline,” said Mark Lowcock, the UN Emergency Relief Coordinator, in a statement issued overnight by the UN Office for the Coordination of Humanitarian Affairs (OCHA). Mr. Lowcock, also the UN Under-Secretary-General for Humanitarian Affairs, encouraged all donors to contribute to the recently launched 2018 Yemen Humanitarian Response plan, which requires $2.96 billion to provide life-saving assistance and protection to more than 13 million people across the country this year. He welcomed the nearly $1 billion pledge by Saudi Arabia and the United Arab Emirates as well as an additional $500 million in commitment from regional donors. He also noted the importance of keeping all of Yemen's ports, including Hudaydah and Saleef, open to humanitarian assistance and commercial imports of food, fuel and medicines. Over 70 per cent of people in need of assistance live in proximity to those two Red Sea ports. Since the decision to re-open Hudaydah and Saleef last month, the United Nations and its partners have successfully delivered large volumes of food, medicines and fuel to people in need, he said. “Yemenis have suffered for too long,” Mr. Lowcock said, calling on all parties to cease hostilities and engage meaningfully with the UN to achieve a lasting political settlement. On Monday, UN Spokesman Stéphane Dujarric told the press that the UN Special Envoy for Yemen, Ismail Ould Cheikh Ahmed, intends not to continue in his position beyond his current contract ending in February 2018. Since the uprisings in Yemen began in early 2011, the United Nations has been actively engaged in mediation efforts to help Yemenis to find a peaceful solution to the conflict and enable the resumption of a peaceful, orderly and inclusive political transition. 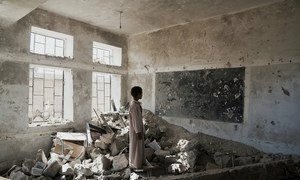 With the crisis in war-ravaged Yemen continuing to deteriorate, United Nations agencies and humanitarian partners have launched a $2.96 billion response plan to reach over 13 million people with lifesaving assistance.